The first time I heard about this book I desperately wanted to read it, because it reminded me of the tales my grand mother used to tell me when I was a child. Despite knowing it was a children's book, I was looking forward to finding out the message behind the story. 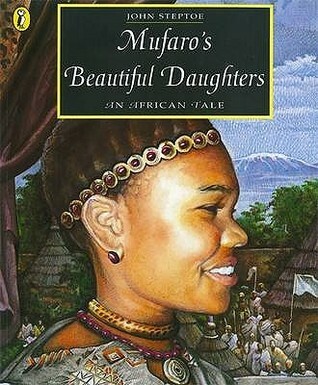 With its charming illustrations, Mufaro's beautiful Daughters narrates the story of two beautiful sisters. While one was sweet, warm and kind, the other was not. One day the king of the village requested to see all the young women so that, he could choose one of them as a wife. Both sisters were enthusiastic about the news when they start out on the journey. However, among all the women of the land, the kind sister was the chosen wife, because of her kindness, generosity and tenderheartedness. Following from this, the message behind Mufaro's beautiful Daughters is the importance of being kind, generous, helpful, compassionate, gracious, considerate, good-natured among other virtues. In other words, beauty without virtue is worthless. The author, John Steptoe was actually not an African writer but an award winning and a very well acclaimed African-American writer and illustrator specialised in children's book that expounds on the African experience. Unfortunately, he died two years after publishing his magnum opus "Mufaro's Beautiful Daughters", at the young age of thirty-eight, in 1989. Please, read more about him by clicking here. Visit his official website by clicking here. This Children's book is the type I wouldn't hesitate to read to my own child. So said, I highly recommend it to all parents. This sounds wonderful. Children of all races need to hear - and believe - this message, that kindness is more important than physical appearance. Debbie, nowadays is so hard to convince the society (especially young women) that being humane is more important than possessing physical beauty. Probably, we need to take a brake and think about what we are doing wrong and, get it right done. I love this book. I read it years ago in high school (I worked in a library) and remembered it as soon as I saw the cover. The story is great and the illustrations are gorgeous. It's amazing how there adults (like us) who still love children's book.... The illustrations as you said are gorgeous and impressive.. I am glad you did. Please feel free here anytime. Eu seriamente amo blog ... Agradável cores e tema. Você construir este site você mesmo?